Great light huge spread of light had it on my 24x24x24 frag tank for lps and did great ! A80 Tuna Blue Unit quit after 90 days, replacement unit quit after two weeks. Service dept is great, but product doesn't seem to work well. Waiting on second replacement. Don't know how this is my fault. Nice light but cannot get it to work. I have had a few LED fixtures in the past, including Kessil A160s. Those light were great, but the fan noise was too much for the wife. These A80s are passively cooled, so no more fan noise! They are about half the wattage of the A160, so you'll need two of them instead of one, but silence is golden. Used this on a Nuvo 10 Fusion for the past 11 month and have seen great growth from LPS/ anemones/ and some encrusting corals. I was not super confident in it being able to do higher light req SPS so I did not try. I was using it with the spectral controller so that way it would ramp up and down throughout the day highest point being 10% / 90% blue. The shimmer and color are great for the light. I just upgraded my lighting to a xr-15 in preparation for a lagoon 25, and when that happens I will use this light again on the 10gal which will become the quarantine. 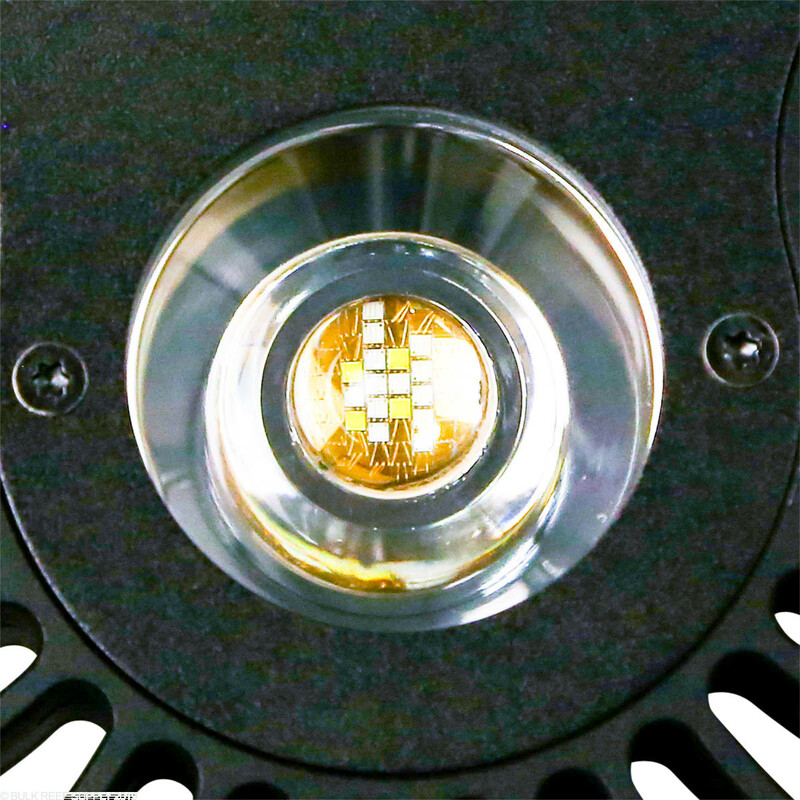 This light looks like it was custom made for the Innovative Marine Nuvo Fusion 10. Very sleek, enough power some simple sps and about anything else that requires less light. Has that Kessil shimmer. Nothing like it. This light makes the tank look awesome with its perfect color blending and shimmer. I wish there was a narrow angle version so I could mount two on my 20 long and not have any light spill over. Bought this to go with my I.M. 10 Nuvo. Seems like a perfect match. Great color and coverage. 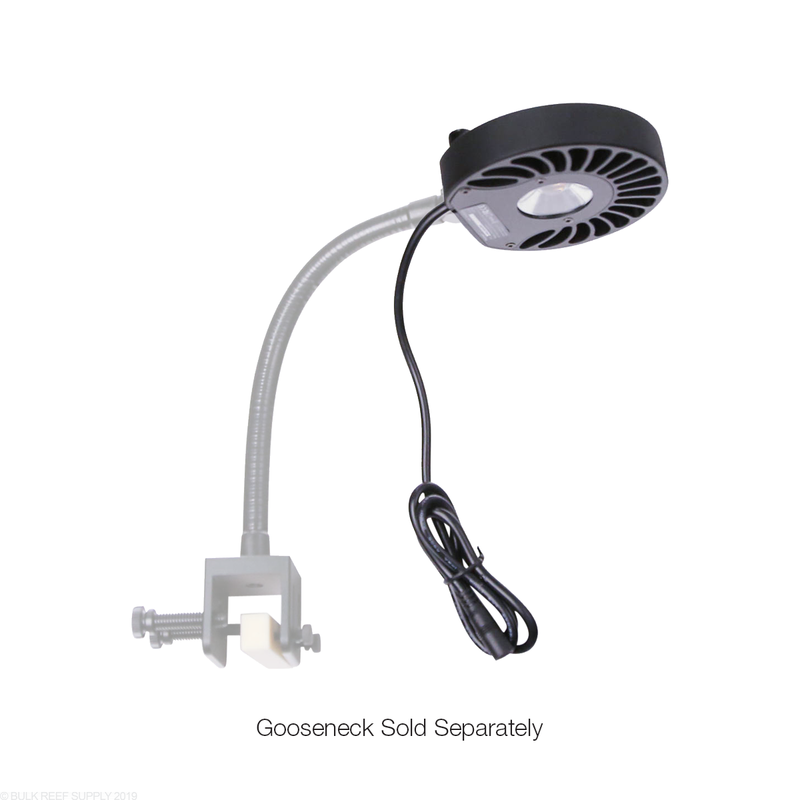 Down side, have to buy the goose neck. Overall time will tell. Growing birds nest and pagoda cup corals so far under this little bugger. I have it over my 40 breeder sump with the supplied bracket. depth from light to corals is about 14"-18" away. The corals are about three to six inches below the water surface. Will buy another one. Apex controlled for lighting schedule. I just got this light in the mail today. My tank is currently cycle so no livestock to see how it grows corals, but will update in a few months when i can report on that. So far the light looks awesome and produces a nice shine in the tank. Tip: if you order the light after set up like me, make sure you have about two inches of space between the back glass of the tank and the wall you are putting the tank against. I bought this light the weekend that they first had it it has been overall amazing on my JBJ 28gallon anemone cube! Put this in my refugium that I'm using to grow out xenia as a nutrient export. I like that it doesn't have a fan to create additional noise. The xenia is doing well and it is also maintaining my temporary frag rack and mangroves until I find a better spot for them. Would two of these be enough for a IM 25 lagoon? I cannot find any par numbers. 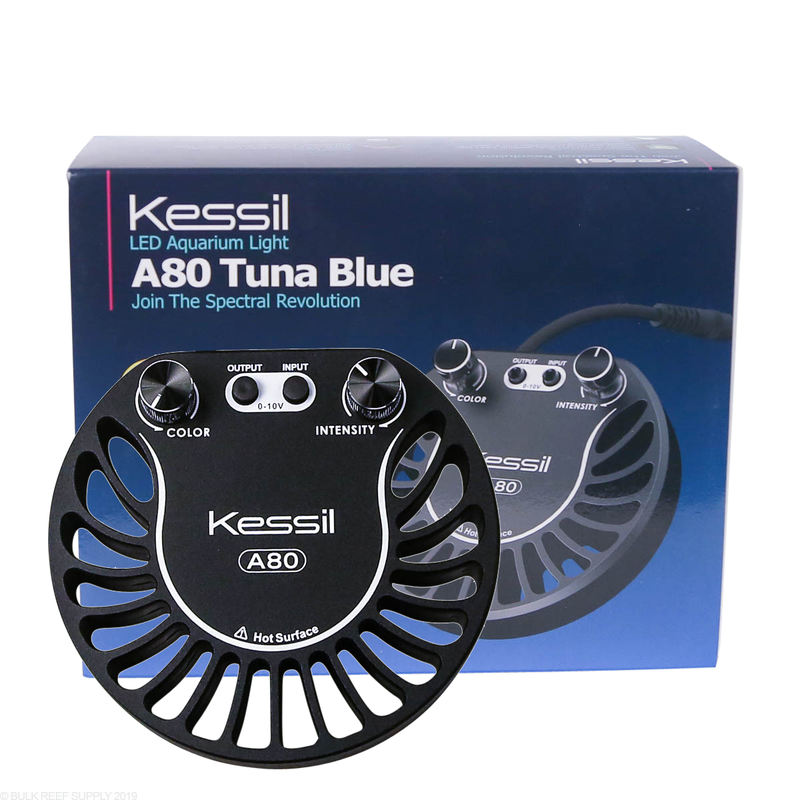 Without a controller (Kessil or Apex) you have to manually turn the unit on/off correct? Also, with either controller, can you control spectrum from it? Or are you just controlling the intensity? The A80 Lights without an external controller would need to be manually turned on/off through the tuning dials or the power source. Most people will use a cheap Christmas light style timer to control the on and off function so the spectrum and intensity are always the same when it is on then. If you use an Apex, or the Kessil controller you can adjust the intensity and the spectrum from the controllers. Thanks for the questions and have a great day! 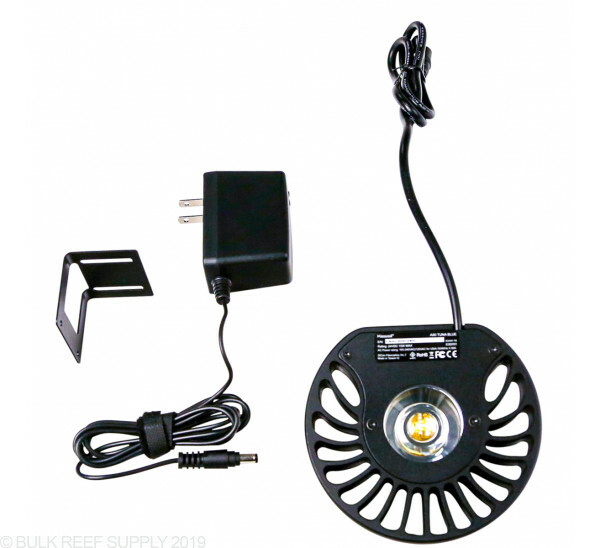 Can I control this light using a reef keeper light? 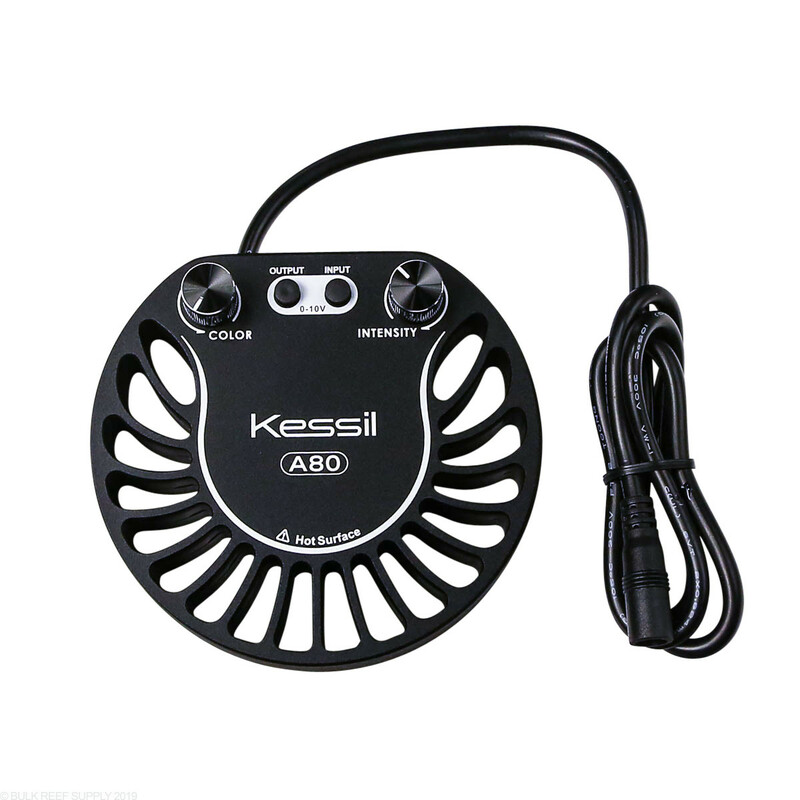 So long as you have the ALC module, you can control the Kessil through the 0-10v dimming port and you'll just need the control cable to plug the light into the ALC. From there, you can control dimming and spectrum. Can two of these work on a 45 gallon long 48' long 18' wide 13'high? Also the how long are the wires to run a connection for two lights into the spectral control ? 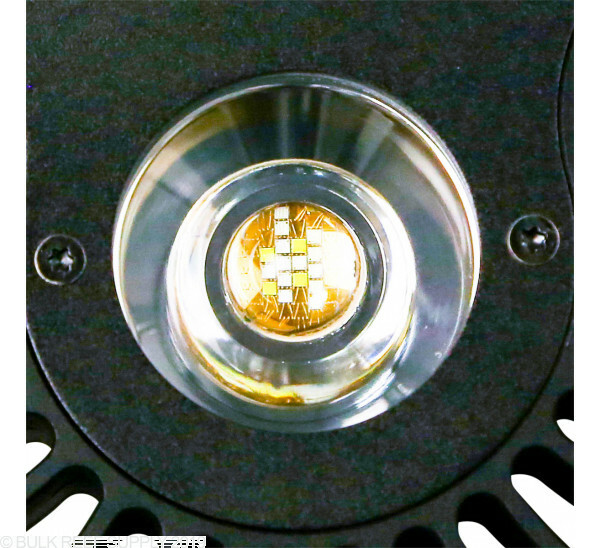 Due to the relatively low output and small size of the light arrays, these are best used on very small tanks and may not serve well on a tank of those dimensions. 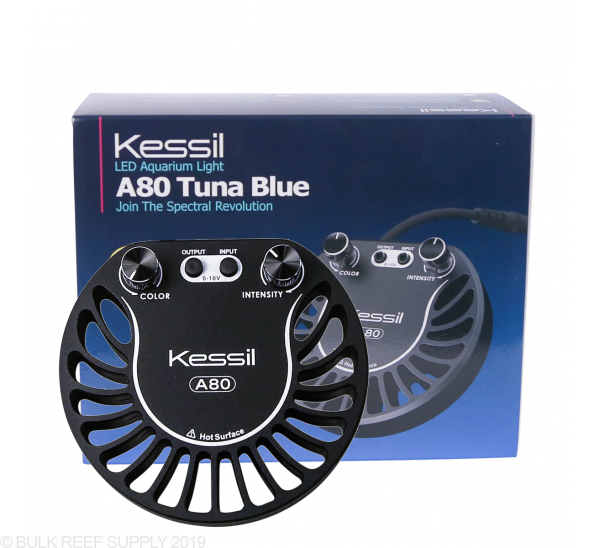 We would typically recommend a pair of A160's for a mixed reef, or perhaps a pair of A360's for an sps dominated tank. For linking fixtures together, there are link cables available in 6ft or 20ft lengths. The spectral controller itself has a 6ft cable to extend to the master Kessil fixture. Would one of these work for a 32 gallon biocube that is 21x21x19 or should I use two? I would recommend at least a pair of A80's for a tank of this size, and that would really only be suitable for a low-light setup. If you intend to keep higher light corals in the tank, particularly anywhere near the bottom, I would likely step up to an A160 or for an sps dominated tank even an A360. Hey there, thanks for reaching out to us! These lights are geared more towards nano/pico type of tanks. I would say that they are going to be under-powered in spread and PAR to properly light your tank. :-) I would recommend at least 2-A360W Tuna Blue fixtures or a single AP700. Would this work in conjunction with two a160's and a spectral controller. I was thinking of putting this in the middle of the 160s on a IM30L. This would likely not be an effective solution. Part of the issue is that the Spectral Controller can only be set to one schedule and set of ramp up/ramp down. Since the A80 is only 15 watts, you may find that you want different intensity settings compared to more powerful options like the 160s. 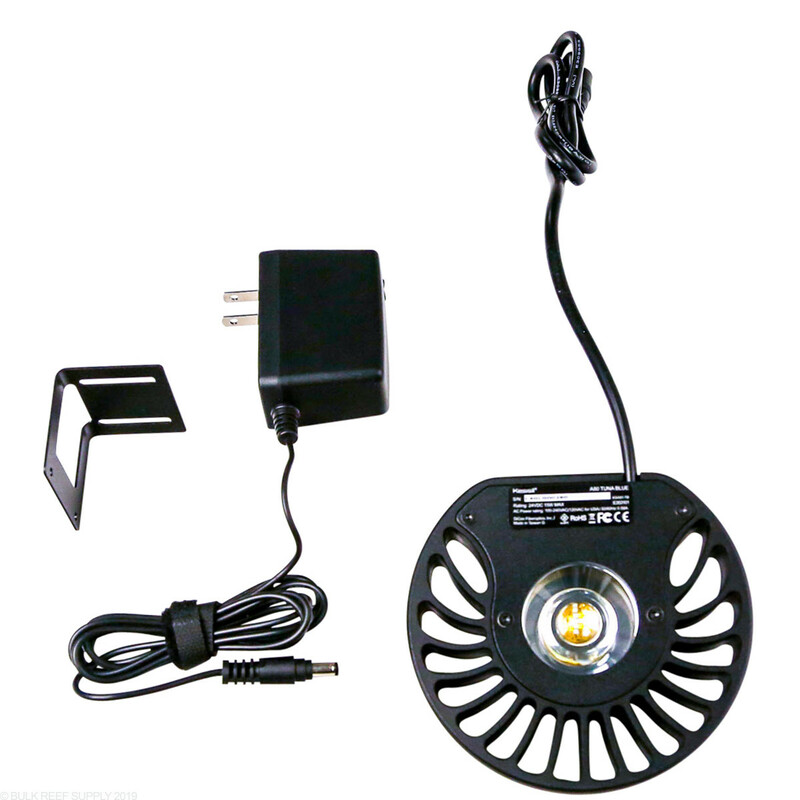 Hi, I was wondering whether this light could house simpler sps, such as bird nest and maybe some montipora In a IM 10 gallon? Also what is the par numbers as I have not found any? If I have a 10g tank and I want soft coral and lps like zoanthids, candy cane, and hammer coral should I use this light. Right now I have the current USA orbit marine would this light be a nice upgrade or would it be like the same as I have now. Hey guys! Your thoughts on a couple of these on a 20 gallon long? 30x12x12? If I was to put this on my frag tank 12x12x5 would I be able to keep sps in the center of the tank and the lps on the outside ? I'm looking to run both a nano and my main setup. I have A360s on my main setup run off of a spectral controller. Can I slave one of these off of the A360s on the main system? I'm afraid the spectral range on the H series grow lights is different from standard reef lights and will require the H series specific controller. I am setting up a 40 breeder tank. I plan on mainly fish and some soft corals. Do you think 2 a 80 would work out? Thank you for reaching out to Bulk Reef Supply! Yes, two A80 units evenly spaced should do the trick as they have a recommended spread of 18" each. I hope this was helpful. Please reach back out if you have any further questions! Can I control this with an apex controller? What would I need to do so? 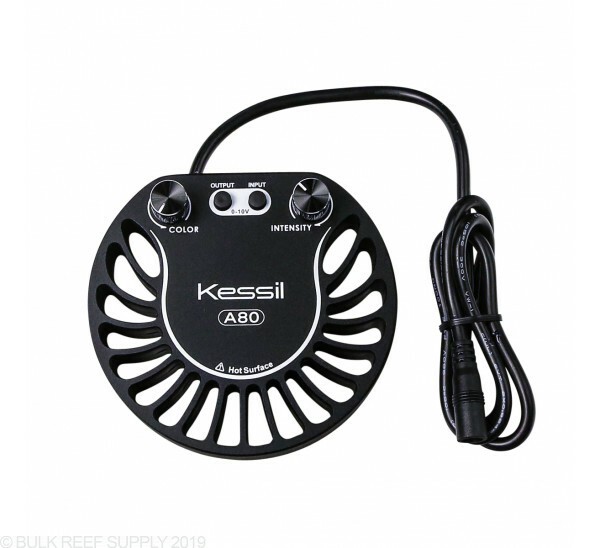 This light is recommended for coral growth, we would recommend using the Kessil H80 for that purpose. Will this grow soft, lps, and sps corals in my ten gallon tank. Also you may not know the answer to this but I currently have the asta lumini for the tank will this keep my corals alive for about a month while I save up for a better this light. Thanks for getting in touch with us in regards to lighting your ten gallon aquarium. I can say that I have personally used this light over a Nuvo ten gallon and was able to grow even a Deresa clam on the bottom. This light should allow for the growth of anything that you would want to have in that ten gallon. For higher light demand critters you may want to strategically place them to keep them in a good area of coverage depending on the length of the tank. Please let me know if there is anything else that we can assist with. Thanks! Will 3 of these work on a 72inx24inx24in tank?